Archaeologist Edgar Lee Hewett had a profound impact on art as it developed in New Mexico and beyond. During the early 1900s, he established a school and two major museums in Santa Fe, today known as the School for Advanced Research, the Museum of New Mexico, and the New Mexico Museum of Art. In addition to training the first generation of southwestern archaeologists, he provided jobs and studio space for Santa Fe’s first resident artists and played a key role in the development of Pueblo painting. He provided support for young Pueblo artists such as Fred Kabotie, and hosted the world’s first exhibition of Pueblo watercolor painting. His role in establishing the Southwest Indian Fair, precursor to today’s Santa Fe Indian Market, will be discussed, and the artists’ relationship with Hewett will be examined. Presentations and panel discussions will take place at St. Francis Auditorium at 107 West Palace Ave. at the New Mexico Museum of Art in Santa Fe, New Mexico. Panel Discussion — Speakers: Bruce Bernstein, Panel Discussant, with artists Russell Sanchez and Milford Nahohai. 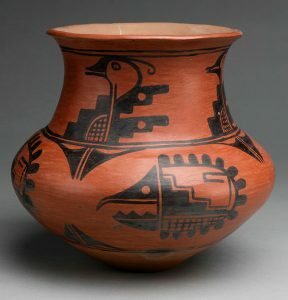 Panelists will discuss the roots of the Pueblo Pottery Fund, founded in 1922 and incorporated three years later as the Indian Arts Fund. The talk will focus on the Fund’s impact on those collecting Native American art and its effect on the lives of the artists and their descendants. Bruce Bernstein is considered one of the leading authorities on Southwestern Native American art. Bernstein received his doctorate in anthropology from the University of New Mexico in 1993. A trained ethnologist, he has worked as a curator and museum director both in Santa Fe and Washington, DC. He currently serves as executive director of Ralph T. Coe Center for the Arts in Santa Fe. His numerous publications include Santa Fe Indian Market: A History of Native Arts and the Marketplace (Museum of New Mexico Press, 2012). Russell Sanchez is a renowned potter from San Ildefonso Pueblo where he conscientiously and insightfully continues the long traditions of innovative pottery from his village. Russell’s work is found in private and public collections throughout the United States. With winning a prize for his first entry into Indian Market at age eight, he clearly indicated his abilities and intentions of becoming one of the most important potters of the late twentieth and early twenty-first centuries. He learned pottery making from the matriarchs of his village. Milford Nahohai is from Zuni Pueblo. His mother, Josephine Nahohai, was the 1985-1986 Katrin H. Lamon Fellow in Native American Art and Education, one of SAR’s first artist fellows. Josephine and her olla maiden sisters danced the Zuni ollas back to life during their fellowship at SAR. Studying older pottery solidified Josephine’s memories, strengthening the family’s resolve to return Zuni pottery to its traditional forms. SAR administration building, located on the estate known as “El Delirio”, former home of Elizabeth and Martha White. Local author and architecture specialist Christine Mather will discuss the evolution of Pueblo Revival style in Santa Fe. The style is rooted in concepts of Hispanic and Pueblo architecture, specifically as seen in the Mission churches. The presentation will take place at St. Francis Auditorium at the New Mexico Museum of Art, a Revival-style building constructed in the era of Edgar Lee Hewett’s leadership. SAR will offer the option to take one of two special tours immediately following the public lecture. Each tour can accommodate 30 registrants. Fee for non-members is $15; free to members. To join SAR, click here. 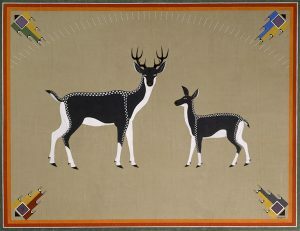 Indian Arts Research Center: Enjoy a docent-led walk through the collection of nearly 12,000 items of Southwestern Native American art, including pottery, textiles, basketry, jewelry, carvings and more. Register here. Estate Tour: Explore SAR’s historic estate with your guide, SAR Scholar-in-Residence, Nancy Owen Lewis. The estate tour features architecture by William Penhallow Henderson, artwork by Gustave Baumann, blooming gardens and more. Register here. Brian Vallo, Director of the Indian Arts Research Center, and a panel of Native American artists explore the history and evolution of textile arts in Pueblo communities. The panel includes: Louie Garcia from the Prio Manso Tiwa tribe of Guadalupe Pueblo in Las Cruces, known for revitalizing historic pueblo weaving techniques; Ramona Sakiestewa, a Hopi artist who lives and works in Santa Fe and is known for tapestries and architectural public art installations; and, Isabel Gonzales of Jemez Pueblo credited for reintroducing historic pueblo embroidery on both traditional and non-traditional textiles. 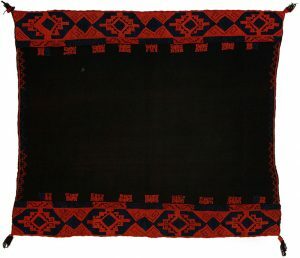 The panelists will discuss how the collection, the SAR fellowship, and access to the IARC collections advanced their careers as artists and keepers of traditional knowledge associated with the textile tradition. Special tours of SAR’s Indian Arts Research Center’s collections of nearly 12,000 items of Southwestern Native American art, including pottery, textiles, basketry, jewelry, carvings and more, will be available for the first 30 registrants. To register for these special tours, click here. Fee for non-members is $15; free to members. To join SAR, click here. For more information on these special tours and other tours, please call or email Daniel Kurnit at 505-954-7272 or at kurnit@sarsf.org. 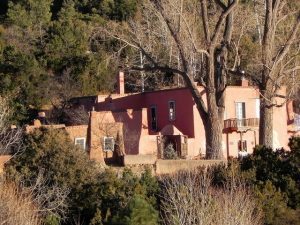 The tour will feature four historic homes, located on or near Canyon Road, of pioneering artists who helped shape Southwestern art during the early 1900s. HSFF will provide information, a detailed map, and knowledgeable guides in each home. 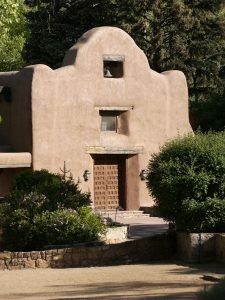 For more information, please visit https://www.historicsantafe.org/artisthometour. Please note, the reservations for this tour have reached capacity. If you would like to be added to a waitlist please email melanie@historicsantafe.org. This program is presented in partnership with the New Mexico Museum of Art in honor of their centennial celebration, SAR’s 110th anniversary, and the 40th anniversary of the Indian Arts Research Center (IARC) at SAR. Funding for this program is provided in part by a grant from the New Mexico Humanities Council.